Propolis Projects, LLC is an effort developed by the Levin Family Foundation and its mission is to combat the recent decline of pollinators in the Midwest and restore healthier honey bee populations in Ohio. During recent years, honeybees have shown an accelerated rate of decline. This is due to a number of factors, including increased susceptibility to diseases and pests such the Varroa mite, lack of forage, pesticide exposure, and hive management, according to the Honeybee Health Coalition. This decline in pollinators affects the health of natural ecosystems, the productivity of commercial agriculture, and therefore the economy. Pollinators contribute substantially to the economy of the United States and are vital to keeping fruits, nuts, and vegetables in our diets. 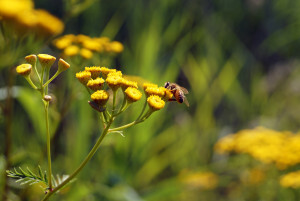 Over the past few decades, there has been a significant loss of pollinators—including honey bees, native bees, birds, bats, and butterflies—from the environment. The problem is serious and poses a significant challenge that needs to be addressed to ensure the sustainability of our food production systems, avoid additional economic impacts on the agricultural sector, and protect the health of the environment.